Seoul is a far cry from Prague. In 2009, on his first European tour, President Barack Obama introduced himself to Europe and to the world with a profound speech addressing the threat of nuclear weapons in a post-Cold War world. This speech, lofty in both tone and ambition, demanded a serious commitment to disarmament. The president expounded upon his dream of a world free from nuclear weapons, reached by the cooperation of the international community. He said, “We must confront [it], not by splitting apart but by standing together … the voices for peace and progress must be raised together.” Set against the picturesque backdrop of Hradcany Square, the speech seemed a poetic beginning to the path towards total global disarmament. Three years later, poetry has become prose and the promise of Prague has become the stagnation of Seoul. 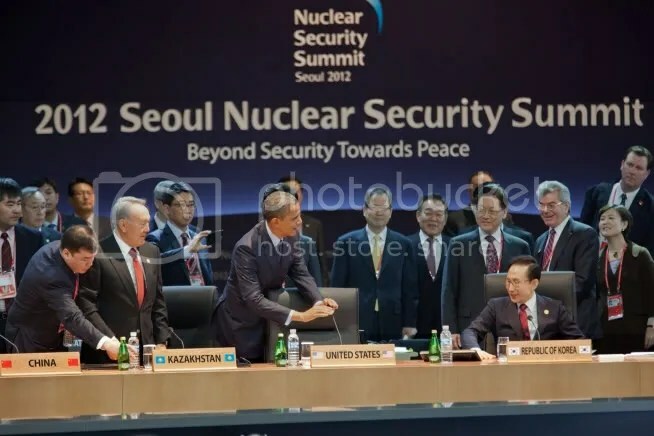 Late last month, delegates from 58 countries (including President Obama) met in South Korea to discuss the threat of nuclear terrorism. This conference, the second of its kind, was organized after the Prague speech to facilitate international agreements on nonproliferation. However, the communiqué that the Seoul summit produced is uninspiring. To achieve the vague goal of a “safer world for all”, the document asserts that the 58 signatories will “secure all vulnerable nuclear materials in four years”. Furthermore, it emphasizes that the International Atomic Energy Agency (IAEA) is crucial to facilitating international cooperation on the nuclear issue . What does this amount to? Not much. The IAEA is a limited institution and if a host country decides not to show IAEA inspectors a certain nuclear facility, the IAEA is helpless and that portion of the nation’s nuclear complex must remain a mystery. The resulting uncertainty can cause dangerous consequences. For example, if Iran allowed IAEA inspectors into its hitherto hidden facilities, Israel would not be teetering on the brink of a military action justified by uncertainty. The incomplete information produced by the IAEA, then, can cause just as much chaos as no information whatsoever. Rather than simply supporting an unreformed IAEA, the nations at the Seoul conference should have discussed how to make it work more effectively. Furthermore, these nations should have established a more precise goal than to “secure all vulnerable nuclear material”. What determines if nuclear material is vulnerable? And how does one decide when that material has been secured? A more effective goal would have been to set standards for security at nuclear sites, and then reprimand those nations that fail to meet those standards. Lastly, the conference utterly failed to address two of today’s most worrying nuclear issues: the threats posed by North Korea and Iran. Not only were these countries not invited, they were not even on the agenda of the meeting. In a meeting about the threat of nuclear terrorism, how does one justify ignoring Iran, a state-sponsor of terrorism that may be in the process of developing a nuclear weapon? Can the attending nations satisfy themselves with empty declarations of North Korea’s guilt while it openly plans to launch a satellite that some believe is a test of its missile capabilities? This failure to tackle pressing nuclear issues is demonstrative of the international community’s complacency in the fight for disarmament. In Prague, President Obama made it clear that a post-nuclear world would require years of difficult work. In Seoul, 58 nations were unwilling to get their hands dirty.